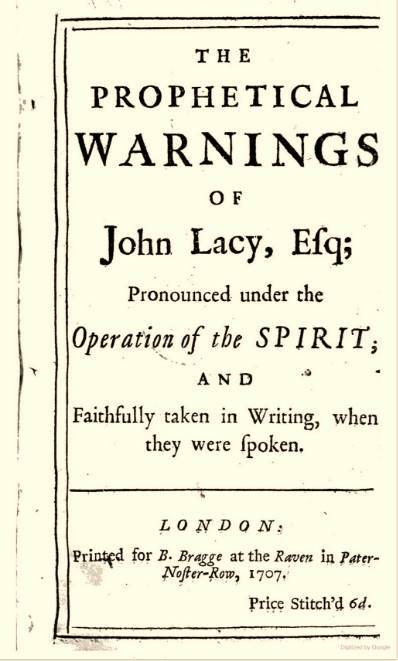 The most prominent Englishman among the French Prophets, John Lacy, was born in Saffron Walden in Essex in 1664. He was a prosperous Justice of the Peace, a married man and one of the leading members of the Presbyterian congregation of Westminster Chapel. He was also a close friend of Sir Richard Bulkeley, and an active member of the Society for the Reformation of Manners; in 1704 he had written a pamphlet in defence of occasional conformity, lamenting the loss of the spirit of unity in "this Relapsed and Apostate World" (quoted Schwartz, The French Prophets, p.64). After hearing the three prophets and talking to refugees from the Cévennes, Lacy became convinced that their utterances represented "the Truth of Divine Inspiration". In 1707 he published an English translation of Misson's history under the title A Cry from the Desert. In his Preface he observes that the contortions and agitations of the inspirés resembled those of the Old Testament prophets who also displayed "divers strange Gestures of Body". For Lacy the miracles in the Cévennes were only the prelude to a new outpouring of the Holy Spirit, which was to be centred on England and was "speedily expected." Shortly afterwards Lacy himself became the first English convert to receive the "gift" of prophecy. On the very day that he delivered his translation to the printer, 1st March 1707, he was seized with "bodily agitations", and some months later, in June, he made his first prophetic pronouncements. He subsequently became a leading figure in the movement. He put his legal expertise to the service of the group and organised rental of the meeting house in the Barbican. He also published a number of justifications, accounts of his own experience, and three volumes of utterances, entitled The Prophetic Warnings of John Lacy. 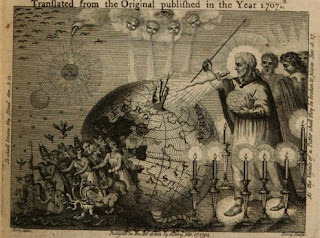 Illustration from a later 18th-century book of "Prophetical Extracts"
In these works Lacy emphasises that he did not consider himself marked out or deserving of special distinction. His pronouncements "under the Spirit" were completely outside his voluntary control. The onset of the Spirit's descent was marked by "agitations" which characteristically came upon him fifteen minutes or so in advance of his prophecies - heaving of the chest, gasping and "hiccuping". On one occasion he was recorded as seeming to levitate and be thrown across the room. According to Lacy the agitations "sensibly refresh the Body" and "do not waste the Spirits, but exhilarate". Emotional catharsis followed the Spirit's departure. Lacy also performed automatic writing - his fingers would contract of their own accord and his hand would write out divine warnings. He would "speak in tongues", Greek, Latin and French, which he did not understand in his waking state since, unlike his older brothers, he had not received a university education. (Opponents pointed out that he had translated from the French and had at least some schooling in the classics). In the course of late 1707 and 1708 Lacy found himself the vehicle for a number of miraculous cures. They were attested by his friend, Sir Richard Bulkeley, who was himself healed of a catalogue of afflictions. In a pamphet of 1708 Lacy enumerated the instances - mostly fairly modest cases of fevers and sores. On 17th August 1707 Elizabeth Gray claimed, under inspiration, that Lacy would heal her. She commenced to choke and suffocate but Lacy failed to deliver – in the end she came out of the ordeal by herself. On a subsequent occasion, however, he cured her of temporary (and no doubt hysterical) blindness. Lacy also found himself drawn unhappily into the fiasco of the resurrection of Dr.Emes. He was induced by critics to set a definite date for the miracle, but failed to attend the meeting at Bunhill Fields and subsequently retracted his claims. In 1711 Lacy was to cause consternation among the faithful by leaving his wife and entering an adulterous relationship with Elizabeth Gray. In a published letter to Thomas Dutton, he claimed that God had explicitly commanded him to do this, with "a supernatural outward Voice heard, that threaten'd me with Eternal Destruction and Hell-Fire if I disobey'd". Betty Gray was to give birth to a new Messiah. The couple settled in Lancashire, where, Betty, alas, produced only girls. He was not expelled from the group for his behaviour, though his influence was much diminished. Behind Lacy's outward respectability and lucid pen, lay a troubled personality and a history of financial difficulties. His minister at Westminster, Edmund Calamy mentions an unsuccessful lawsuit in 1704 which had plunged him into an irrational depression. In 1708 he attempted to sell his land and manor in Littlebury, Essex in 1708, hoping to raise £10,000 to pay off his debts. Fortunately for the family, the bulk of his estate remained in trust and he was forced to live off a relatively modest allowance. - A Cry from the Desart, or Testimonials of the Miraculous Things lately come to pass in the Cevennes (London 1707) translation of Maximilien Misson, Le Théâtre sacré des Cévennes. - The Prophetical Warnings of John Lacy Esq. ; pronounced under the Operation of the Spirit: and Faithfully Taken in Writing, when they were Spoken (London 1707). Preface dated July 18th. - Warnings of the Eternal Spirit, by the Mouth of his Servant John, sirnam'd Lacy. (2nd and 3rd parts, London 1707). 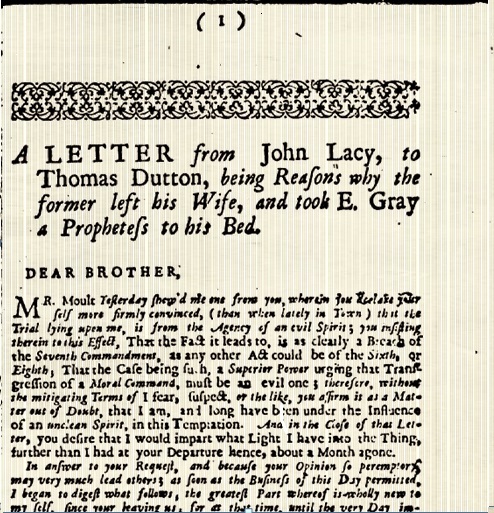 - Letter from John Lacy, to Thomas Dutton, being Reasons why the former left his Wife, and took E. Gray a Prophetess to his Bed, dated 6th March 1711 in Keimer, A Brand pluck'ed from Burning (1718), app. The bodily Impressions were gradually increasing upon me 'till the Effect or rather Issue of them was produced, to wit, the Opening my Mouth to speak. They began by a preternatural Course of Breathing; then my Head came to be agitated or shaken violently and forcibly, and with a very quick Motion horizontally, or from Side to Side: then my Stomach had Twitches not much unlike a Hyccop: afterwards my Hands and Arms were violently shaken, at length a Struggle or Labouring in the Wind-pipe, and sometimes a sort of catching all over my Body; and, for about a Week before my Speaking, I observed my Tongue was now and then moved involuntarily, as were also my Lips, my Mouth, and Jaw severally; all which Preparation of the bodily Organs O found attended with a constant Elevation of my Soul to God; the Mind being unaccountably cast into a Frame of spiritual Joy, holy Contempt of all things in the World...during all this Time, I searched the Scriptures carefully for my Direction, and heedfully consider'd all the Advices given me by Friends. I know assuredly, that no Trouble of Mood, nor Melancholy, nor a Prepossession of Prophetic Schemes drew me into the State that I am under: I enjoy at this Time, thro' Mercy, a perfect Health, without any Pain, Sickness or Weakness whatsoever, or any sort of Disorder proceeding from the frequent ecstatic Agitations; I sleep ordinarily 7 Hours in 23; I have a good Appetite and Digestion; and I appeal to all Persons with whom I converse...whether I am otherwise beside myself, than only to God. Lacy assures his readers he would not have willingly invited the "Clamours and Contempt" that he has suffered; he has been sustained only by the "inward Joy that I have from the Great Comforter". It would otherwise have been "an inexpressible Grief to me, to be a Messenger of ill Tydings to my native Country, which no Man loves better". Lacy declares his loyalty to the Queen and the clergy and ends by emphasising that he no pretensions to particular righteousness. 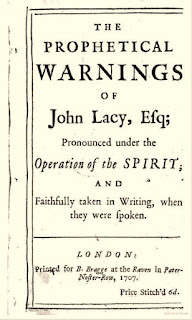 The Prophetical Warnings of John Lacy Esq. (London 1707), p.iv-vii. But 'tis necessary I add further, that God has distinguish'd his Favours to me in the point of Health; so that the Agitations ceasing...leave me perfectly at ease: nor do they bring with them concomitantly any sort of Pain or Oppression; and instead of enfeebling, do sensibly refresh the Body; and whatever be the Violence or Continuance of them, do not waste the Spirits, but exhilarate: the never have injur'd any other Person, no more than him whom they affect. There comes with them an Influx to the Mind also, lifting it up in Prayer to God, withe Reverence and Awe: All which I know of a certainty is so with me; and as God knows it too, I cannot reconcile the same with the Superintendency of an evil Spirit, operating upon me at those times. As soon as I enter'd the Room, which was large and pretty full of People, the first Objects which drew my Observation, were a Woman well drest, on her Knees, and a Man standing before her with his Hands upon her Head, uttering several Sentences, mixt with strange Hiccups, and Shakings of his Head forwards and backwards, his Body as it seem'd to me, jumping while he was speaking. Between every two or three Words speaking, he cry'd, Hoh, Hoh, Hoh, Hoh, O____h, O_____h, O_____h, as if her were taking his last Gasp. This Man's Name was John Lacy, Esq; a Person known by many to be a Man of Sobriety and Substance, and who belong'd to a Congregation of Presbyterians, to whom Edmond Calamy a noted Man, was Preacher. This Laying on of Hands, and speaking to the Person on her Knees, was call'd as I afterwards came to understand, the Gift of Blessing. When the speech was over, the humming and heaving gradually abated. I again took him by the hand and felt his pulse, which moved quick; but I could not perceive by his hands more than common heat. I again asked him how he did. After some time, he rose up, shook himself, and rubbed his eyes, like one just waked out of sleep. I asked him if he would not go down and and end his dinner. When we were got down stairs again, I asked if he distinctly remembered what had passed, and he told me, no. Mr Lacy's Admirers and Abettors may flatter him and themselves that his Intellects are sound and no ways craz'd, but his nearest Relations and best Friends were apprehensive, that his Brain was somewhat touch'd a little before his closing with the pretended French Prophets, and therefore Prayers were put up for him at Mr Calamy's Meeting-House, as I am inform'd, that God would be pleased to restore him to his right Mind. Those who hold that the era of prophecy is at an end are likened to the New Teatament Sadducees who denied the bodily resurrection and angels. For Lacy they are little better than Deists, "Scoffers, Atheists, Sadducees". The work is divided into four parts, which trace the history of prophecy. 1. Divine revelation in the Bible, whether through angels, dreams, prophetic visions and voices. 2. "Uncontroverted" prophecy in the New Testament and Early Church. 3. "Controverted" prophecy in the Montanist heresy. He then gives an account of the case of Hugh Preston, an unbeliever, who was one of Lacy's first cures, on 29th November 1707. Mr Preston's recovery seems more down to hygiene than divine intervention, but the details are worth reproducing (if only for the horrors of 18th-century medicine). There was one Mr P[resto]n who lodg'd in the Underground Rooms of the New Square in Lincolns Inn, Number 2.who is about seventy seven years of Age, and had, about Novemb. 14. last, a Boil that rose in the Nape of his Neck, and very big; at length it broke, and while it was running, no body having the Care to dress it but his Wife, by very ill Managery, it grew so bad, spreading upward and toward each Ear, that when I saw it, it was as big as a large Turnip of five Inches Diameter, and above two Inches high; all of dead Flesh, black and livid; but having divers Orifices in it, out of which Corruption was continually running; and all sides of it, all around, very much inflam'd, and shooting so in the adjacent Parts, that he could get no Rest, for three Nights before we went to visit him. He desir'd that Mr Lacy would pray for a Command from God to come and heal him; who, upon Prayer, was sent thither. We were ten Persons who accompany'd him thither, upon Saturday Night, Nov.29. it was open'd to all our View. There had been a Chirurgion to see it, who, as we were inform'd, had ask'd Ten Pounds to cure it.....And indeed, altho I have been for fifteen Years past much conversant in Cures of Sores, yet I never saw anything like it. However, as I said before, after it was open'd to all our View, it was cover'd again; and then we had Prayers and an Inspiration from two of the Inspir'd. After which (viz. about an Hour and a half) Mr. Lacy order'd that the Sore should be open'd again. The Man declar'd he had immediate Ease from his burning ahd shooting Pain; and indeed, at the second View of it, it seem'd to be diminish'd about a sixth part. Mr Lacy told us we might come and see it again in a Day or two. Upon the Wednesday after, I came to see it; and b that time, it had lost above a third part, and now look'd, for Size, like a flatdry'd Apple, such as comes from beyond Sea, but intirey free from Pain. It was order'd, at first, that nothing of Medicinal Virtue should be appy'd to it; and that only clearn Linen, or a Skin of a Bladder, or the like that might lie close, should be put on; and so it went away, so fast, that every time it was dress'd (which was three or four times a day) the said dead flesh came away in great Strings and Pieces; sticking to whatever was laid upon the Sore. And so in about a Fortnight's time, it was a smooth and level as the back of one's hand, and is and has been ever since perfectly well; of which the old Man is so sensible, that, upon all Occasions, he magnifies and blesses the Name of God. Sir Richard Bulkeley, An Answer to Several Treatises Lately Publish'd on the Subject of the Prophets (1708) p.113-5. Lacy himself enumerates his early successes in his Relation of 1708. In each case it is the Spirit which is described as giving words of healing to the sick person through Lacy, who acts under inspiration. Sir Richard Bulkeley: he was "absolutely cur'd, by the merciful Hand of God, without means, soon after a Promise thereof made him thro' my mouth, under the Operation of the Spirit". Lacy refers the reader to Bulkeley's own account "for more ample satisfaction". Mr James Jackson, in George's Court, near Hicks's-Hall, aged 72. 15th November 1707. His failing eyesight was cured by "a Promise from the Spirit in my mouth":. "he can now write without Spectacles, and even a whole day together, without Failure of Eyesight; and does walk the streets without a Guide". Mrs Mosely, a neighbour of James Jackson, also cured in November. After "A Prayer in the Spirit" and "Words of Healing" she gradually recovered from a fever that had been thought fatal. Mr Preston, lodging in the Underground Room, No.2 of the New Square, Lincoln's-Inn, aged about 77, in November last too, having a Carbuncle on the Nape of his Neck, about five inches in diameter, and two high; after a Prayer, the Spirit said touching him in my mouth, I command away the Tumour: which accordingly went clear away, without any application but a Bladder (to keep it from the Linen) in about ten days after. Mrs. Mary Moor, at Mrs. Norris's in Fashion-Street, Spittlefields, cured in January 1708. Mrs Moor had been confined to her bed for a month with "a deep consumption"; Lacy visited her and "after a Prayer, under the Operation of the Spirit, words of healing were pronounc'd. The Effect was that the very next day she rose at tea, and sat up till eleven at night; and has since continu'd in a good degree of Health"
Mrs Clark, at a China-Ware-House in Queen-Street, in the City, in January - headache. Mr Spong, at a barbers near the Church in Coleman Street, cured on 29th March - ulcer of the jaw. Mr. Burrough's child at the Amsterdam Coffee-House at the Royal Exchange, in April - "swelling of the Evil" (?) and fever, but no outcome as yet. Mr Byeward, in Ormond Street, victualler - completely paralysed. He had been given a conditional promise of healing depending on faith in God and prayers. Mr John Moult, in Watling Street - longstanding paralysis of the hand. This was the chemist Francis Moult's brother; he had been promised a cure in January but nothing had happened as yet. Mr John Holloway, at Dr Bishop's in East-Smithfield, in January - promised a cure for the King's Evil. Mrs Harding's child at Southwark - cough / spitting of blood. Cured in April. Mrs Rustback of Islington - convinced she was cured of breast cancer, though no effect as yet. In April Lacy had a more illustrious supplicant when he was commanded to visit Sir Joseph Tyley at Whitehall, who had been confined to bed for nine months with gout: The Day following, he eat a plentiful Dinner, his Pain ceased; and he continu'd to eat, drink, and sleep, as a Man in reasonable Health..."
Relation of the Dealings of God to his Unworthy Servant John Lacy p.25-27. Samuel Keimer reported that there had been a rumoure for some time among the Believers that John Lacy was to undergo a great Trial. They finally learned that he had been ordered by the Spirit to leave his wife and take Elizabeth Gray, a Prophetess, on whom he was to beget Children. The news "put several of the Believers into a Ferment", especially the women who feared it was a bad precedent. 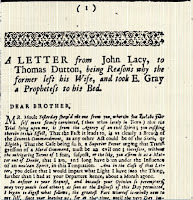 Among those who dissented were the Prophet Thomas Dutton, who was answered in print by Lacy. Some Time after this, (as I take it) John Lacy one Morning gets up betimes, leaves his Wife in Bed...and takes E. Gray, who were both joyn'd together by the Spirit through Mary Keimer, at a Meeting commanded by the Inspir'd. From this Time, or before John Lacy and E. Gray liv'd together, as Man and Wife, and it was prosphecy'd, that as a conformation the Command afore mentioned was from God, the First Child begotten by them should be a Son, and should work Miracles, as soon as born. However, after some Time, E.Gray prov'd with Child, and was deliver'd of a Daughter. It was again prophecy'd the next Child was to be the Son; but that Prophecy likewise prov'd false as the other had done. Notwithstanding all which, they stilll live together in Adultery, believing the Holy god has so commanded. For my own Part, I now sincerely believe that John Lacy did not leave his Wife from any lustful Desire, but solely in Obedience to the Spirit's Commands. A Brand pluck'ed from Burning, p.57-9. After all, it was the happiness of Mr. Lacy's family, that his estate and income (which otherwise, in all probability, had been entirety consumed in sup- porting these prophets and their cause) was legally vested in trustees for the benefit of his wife and children. They paid Mr. Lacy 50/. every quarter for his own separate use and maintenance, without his being accountable to any one, how he spent it. With this allowance, and what ready money he had by him, he went into Lancashire, (a cheap country to live in,) and there cohabited with Betty Grey, and had children by her; having his head still full of inspiration, and discovering no concern for his wife and children whom he had deserted. After some time, he was put into the Spiritual Court, for living in adultery, and Dr. Gastrel, the late Bishop of the Diocese of Chester, (in which he lived,) dealt with him about it. At last, the Bishop inquired, in a private way, whether Mrs. Lacy would receive her husband again, if he could be prevailed with to return to her, (though how far he was commissioned for it, I cannot say) but she positively refusing a thing to which I never heard any one that knew the case, pretend to say she was obliged, he continued living in those parts, and became a thorough-paced Conformist, knelt at the altar, and persisted in his prophetic notions and irregular life, till he died, 1730, without any public sign of repentance. Edmund, Calamy, An historical account of my own life, p.99;113-4. This unhappy Man at last, when the Heat of his Brain had scorched up his Judgment, (as it did all the while he acted the Prophet) instead of taking Shame upon himself, and humbling himself before his God for his Sins, more especially of Pride and Blastsphemy, quitted all Sense of Religion, and turned out a Rake and Libertine - So easy a Transition is the Sink from a crackbrained Zealot to that of an Atheist!